Cal Grants are the foundation of California’s financial aid program for low- and middle-income students pursuing higher education in the state. Cal Grants provide aid for tuition and living expenses that does not have to be paid back. There are two main types of Cal Grants: Entitlement grants and Competitive grants. Entitlement grants are guaranteed to all California students who meet certain income and GPA requirements and apply to college no later than one year after high school graduation and to community college students who are transferring to a four-year college. Nontraditional students who meet the income and GPA requirements and apply for the award by the deadline more than a year after high school graduation are eligible for Competitive Cal Grants. Competitive grant amounts are equivalent to the Entitlement grants, providing tuition assistance up to $12,630 at University of California, $5,742 at California State University, and $9,084 at most private colleges. The main difference between Competitive grants and Entitlement grants is that Entitlement grants are guaranteed to all eligible students, whereas Competitive grants are currently limited to 25,750 students. The number of qualified student applicants for Competitive Cal Grants far exceeds available awards. In 2017-18, more than 340,000 students qualified for an award, but only 25,750 grants were available — meaning 92% of eligible students were not served. 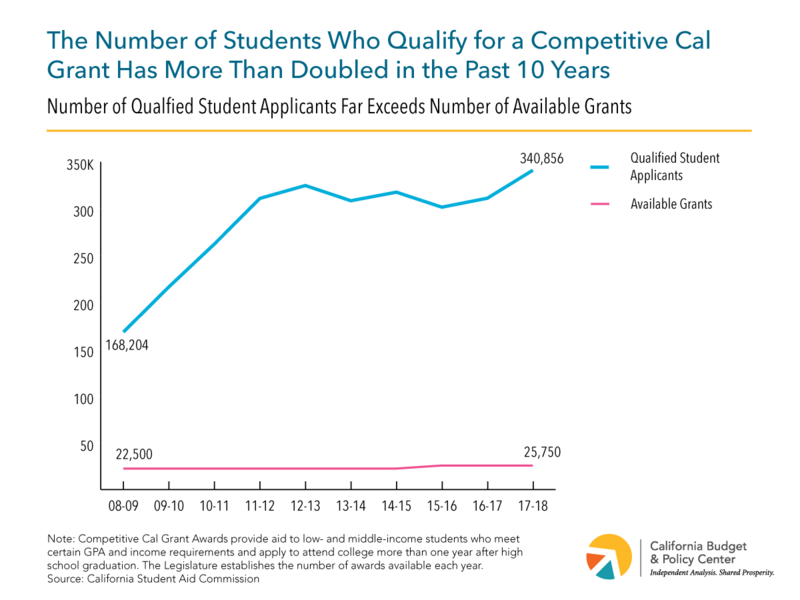 In the past decade, the number of students who are eligible for Competitive Cal Grants has more than doubled (103%), while the number of awards available has increased by less than 15%. In 2008-09, an eligible student had a 13% chance of receiving a Competitive Cal Grant; in 2017-18, it was 8%. California students have a better chance of getting into the University of California, Berkeley than of receiving a Competitive Cal Grant. Nontraditional students, such as those who spend significant time in the workforce before enrolling in college, face significant barriers in their academic pursuits. Many of these students rely on financial aid to be able to afford the rising costs associated with a college degree, yet the probability that they will receive the aid they need to succeed is low — and declining over time. 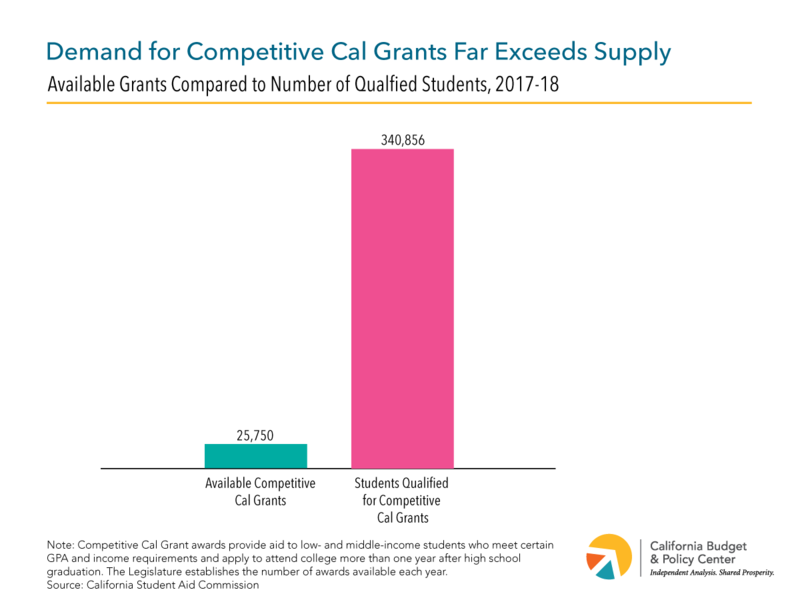 Competitive Cal Grants are one of the most effective financial aid investments the state can make to promote access and affordability because they support the lowest-income and least represented students. Increasing the number of Competitive Cal Grant awards available would help ensure college is affordable for a larger share of nontraditional students. Figures reflect award amounts for the 2018-19 academic year. The increase in eligible students is likely due to improvements in the California Student Aid Commission’s application system and process, an increase in the number of older students seeking to upgrade their skills to improve their job prospects and meet changing labor market demands, and greater financial aid awareness. University of California, Berkeley’s incoming freshman acceptance rate for 2017-18 was 18.3%.